Jennifer Whitenack, a gifted resource teacher at Baker Butler Elementary, leads the Keva Plank Challenge. The gender-neutral blocks are a perennial favorite at Girls’ Geek Days. Programming robots is a serious business, but students, mentors and teachers all seem to have a lot of fun during the monthly Girls’ Geek Day events. Kim Wilkens is the founder of a group called Tech Girls, and also helps organize the Girls’ Geek Day events. 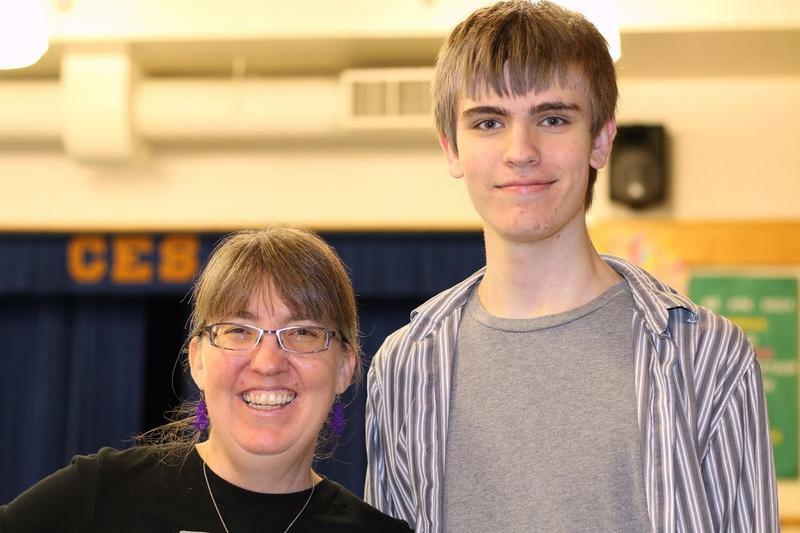 Her son Xander Herrick serves as a mentor during some of the events. 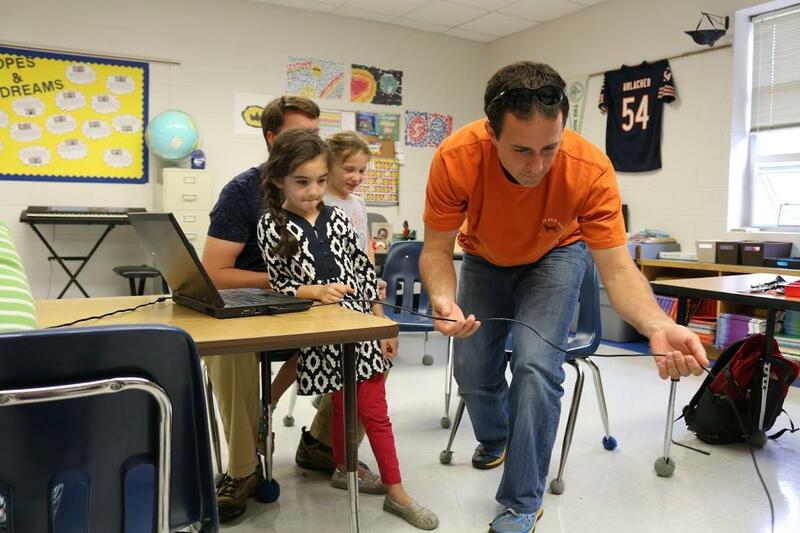 Justin Callahan untangles the cord connecting his daughter’s laptop to her robot during the NXT robotics workshop. He and 6-year old daughter Kinley have attended 3 Girls’ Geek Day events. “It’s a fun way to spend some time with your daughter,” he says. 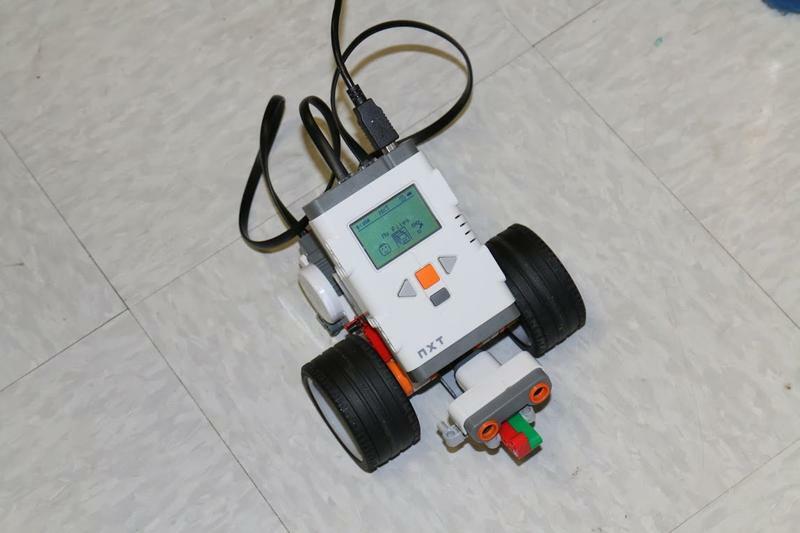 One of the many activities offered during Girls’ Geek Day is NXT Robotics, during which girls — from kindergarten to 5th grade — learn to program this robot. The ramp collapsed! But that’s okay — learning from failure is one of the benefits of participating in Girls’ Geek Day. 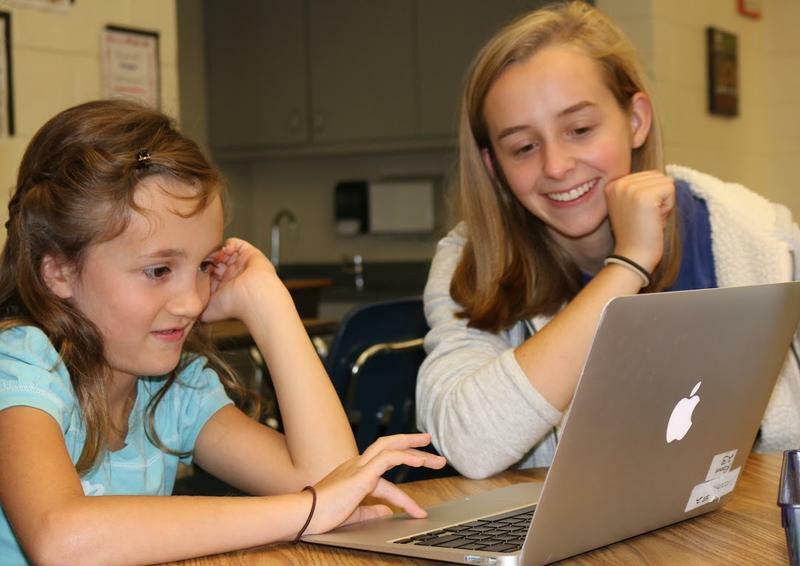 Mentor Megan Bird helps a 7-year old participant learn to code in a program called Scratch. Megan is in 11th grade and says she loves the creativity and patience that the STEM fields require. 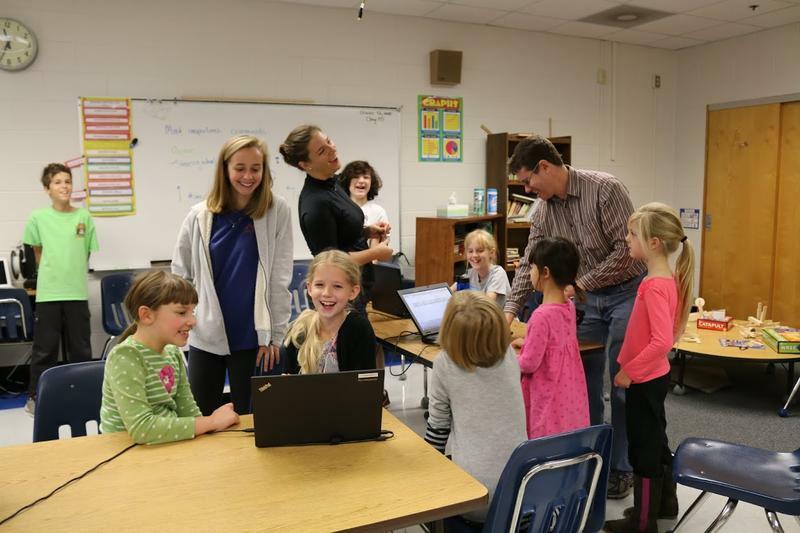 Girls’ Geek Day participants get introduced to coding through a simple drag-and-drop program called Scratch. These engineers are in the 1st and 5th grades, and they’re here at Crozet Elementary School on a Saturday morning, participating in an event called Girls’ Geek Day. PAULA WHITE: Girls’ Geek Day is an opportunity for girls to explore different activities that are around science, technology, engineering, and math and hopefully find their passion. Paula White is a gifted resource teacher in Albemarle County. She started Girls’ Geek Day four years ago as a way to help boost girls’ participation in the “STEM” fields. WHITE: It's building confidence in girls and helping them understand that just because they're females they're not less than anyone else. So it's an attempt to help build their sense of self and self-confidence. There are about 40 girls participating here today —from kindergartners to 5th graders — and many already seem pretty confident. 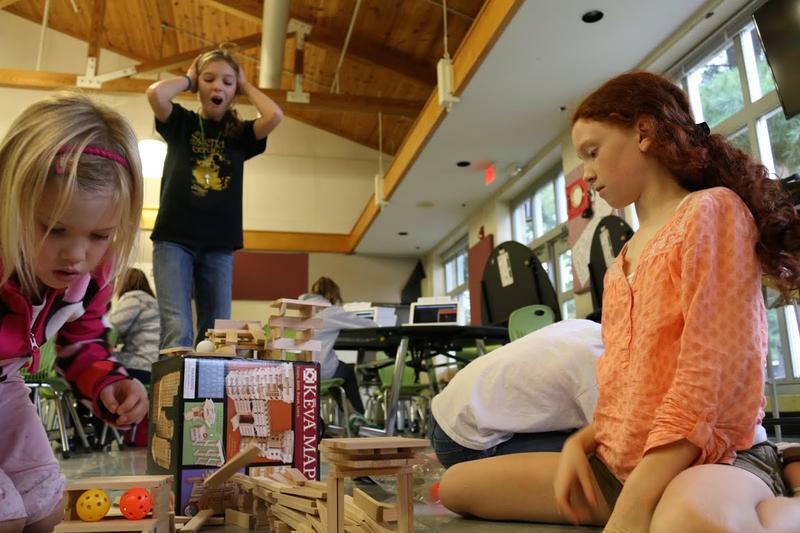 Or at least they’re not cowed by activities like the “Keva Plank challenge,” “Ultimate Tic Tac Toe” or “Math in the Real World.” But research shows that once these girls hit middle school, they’re likely to start shying away from the STEM subjects. Which in turn means they’re much less likely to pursue a career in science, technology, engineering or math, even though those careers are more in demand and more lucrative. Part of the problem is undoubtedly stereotypes. KIM WILKENS: When you think of computer science you think of that nerd in their basement doing stuff by themselves and so that's a big hurdle to get over. 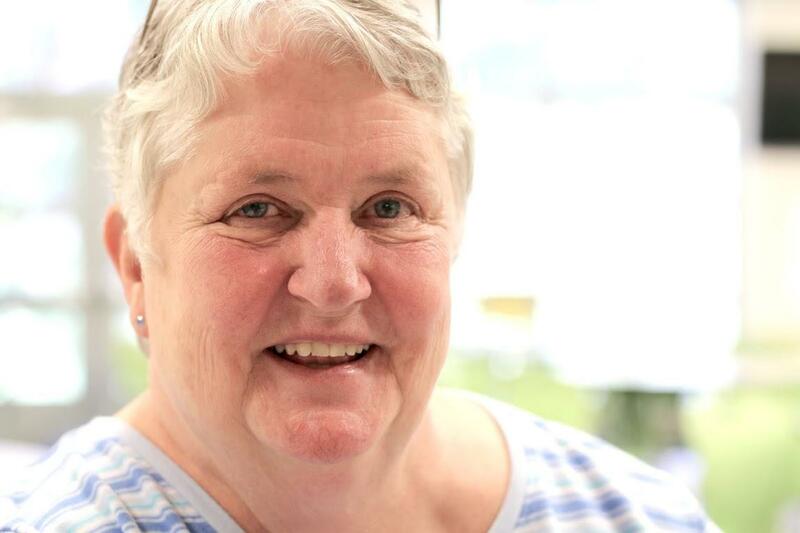 Kim Wilkens teaches computer science in Charlottesville. 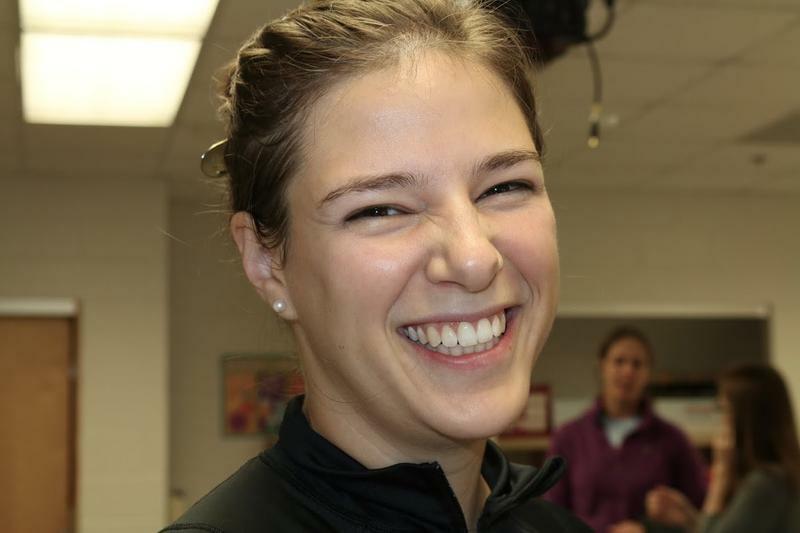 She also runs an organization called Tech Girls, and helps coordinate these Girls’ Geek Days. WILKENS: I’m not trying to turn everybody into computer scientists but I feel that technology is such a part of our everyday lives that everybody — whoever they are — needs to have some basic understanding of coding and computer science wherever they're going to end up. 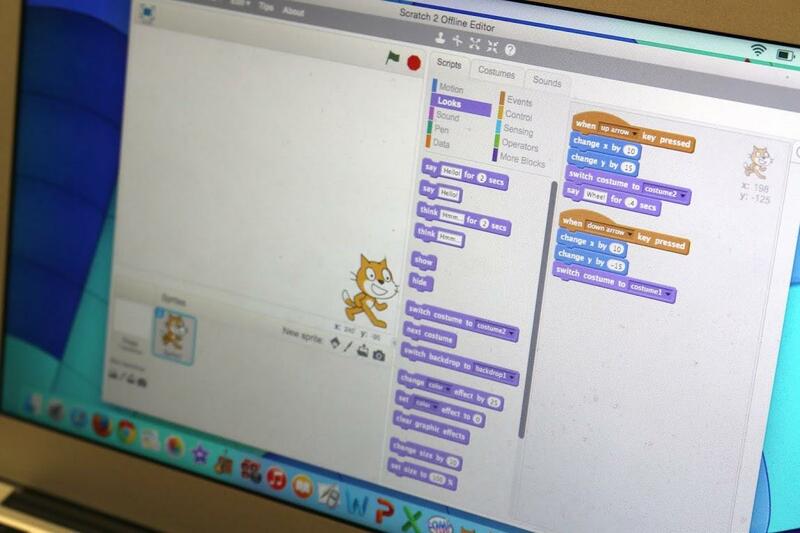 Some of the girls here today are learning to code by animating a cat in a program called Scratch. Seventeen-year old Megan Bird is providing instruction. 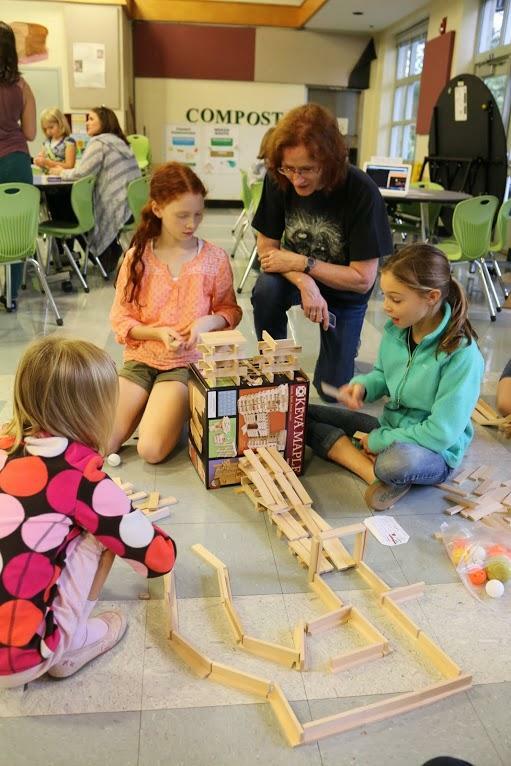 She says she loves STEM, but sees a lack of confidence in it with girls — herself included. MEGAN: I probably could have more confidence in it as well. But I love it, so I would like to grow that confidence. EMILY: What do you love about it? MEGAN: I love the creativity that it requires. And the patience that it requires to figure out just one problem. Meanwhile down the hallway, another group of girls is programming four-wheeled robots. JUSTIN: How was that, Kinley? A couple of dads are here in the room today. Justin Callahan is sitting with his six-year old daughter Kinley. JUSTIN CALLAHAN: She is trying to make a robot drive around a box and she's doing a pretty good job. This is actually Kinley’s 3rd time at Girls’ Geek Day. JUSTIN: It makes her confident, makes her try things she wouldn't try otherwise. It's a fun way to spend some time with your daughter. LYNN: Oh, there we go! LYNN: Yay! We did it guys! Look, it drove forward for one second! LYNN NICHOLS: Girls are taught - more so than boys - that they shouldn't break things. Lynn Nichols is leading the robotics workshop. LYNN NICHOLS: And we're really encouraging that growth mindset to help girls feel comfortable making mistakes. And not being perfect from the get-go. And really continuing to persevere despite obstacles. BRYNN JEFFERSON: I'm on a robotics team and I am one of a tiny percentage of girls. Like, it's almost comical when you walk in and just a sea of boy heads turn and then there's no girls there, and it's really sad and it's a lot easier when people are younger and they're still figuring out who they are, to be like hey STEM is an option it's not just like a boy's club, look at how fun these circuits are. You can grow up, you can keep doing them and really just try to even out the ratio. That's something I'm super passionate about. … may be coming soon to a school near you.